The presence of cysts in a woman's ovary is a natural phenomenon till the cystic complications signal the time to go for a check up. Ovarian cysts can be classified into two distinctive groups, and they are - Functional and Complex. While functional cysts actually perform as part of the ovarian functions, such as helping in the release of ovum at the right time for fertilization, the complex ones do nothing of the sort. Dermoid ovarian cyst falls in the second category. Moreover, it is considered to be a cystic teratoma that contains mature skin that is complete with sweat glands, hair follicles as also pockets of stale blood, fat, bone, cartilages, nails, teeth, and even traces of thyroid tissues. In short, it presents a bizarre picture when removed to display its contents. What are the reasons behind the dermoid cyst or the teratoma (medically referred to as an ovarian tumor consisting of fragments of skin, bones, etc.) that has these bizarre items? They originate from the totipotential germ cells. Although to most people, it may seem very whacky, but the fact remains that the dermoid cyst is quite a common occurrence, particularly in young women. And they are about one-third of all benign (non-cancerous) ovarian cysts . They may occur at any age (not infants though), but most of them are detected in women who are in the child-bearing age. And some women can have ovarian teratoma in both the ovaries. As for dimensions, these growths can range anything between half an inch and seventeen inches in diameter. Of course, as earlier said, the large majority of them are benign, and only about 2% of them are malignant. Except on a routine pelvic examination where ovarian dermoid cysts appear as an enlargement or swelling of the ovary, dermoid cysts usually display no symptom. However, as these abnormal cysts grow in dimension, they often tend to twist (torsion), thus causing intense pain in the lower abdomen. In extremes cases, they can also stop blood supply to the ovary, and this can create serious consequences - even death too. The risk of rupture and spillage of their contents all over the abdominal cavity is also very much there. But the unusually docile nature of ovarian dermoid cyst has been aptly illustrated in the following report published by two eminent doctors who treated a 50 year old patient with large ovarian dermoid cysts. Please read on as the contents will prove quite educative. A 50 year old female was admitted with a slowly growing abdominal mass and occasional pain for 20 years. There was no history of trauma to the abdomen, bladder or bowel dysfunction or any other gynecological problem. On abdominal examination, there was a mass of 12x12 cm size that was situated in the umbilical, right lumbar and right iliac fossa region. The mass was smooth, non tender, fluctuant, mobile in all directions and had well defined margins. It was not moving with respiration. There was no free fluid or other intra-abdominal lump. Per-rectal and systemic examination were normal. Hematological, biochemical investigations and chest radiography were normal. Abdominal radiography showed soft tissue mass in the centre with areas of calcification in it. Ultrasound revealed a large cystic mass of homogenous echo texture with multiple calcific density contents. Computerized Tomography showed a large cystic mass with areas of fat density and calcific foci within it. Exploratory laparotomy indicated that two cysts were present in the omentum. The larger one measured 12x10 cm while the smaller one measured 4x2 cm. The larger cyst was adherent to the urinary bladder. Complete excision of both the cysts was done. The ovaries were normal. Cut section of the specimen showed earthy pultaceous material, tufts of hair, cartilage and bony spicules. Histopathology of the cyst wall showed epidermal lining with lamellated keratin in the lumen and a prominent granular layer. In addition, the wall also showed osteoid fibro-collagenous tissue, bone formation and cystic spaces lined by pseudo-stratified columnar epithelium. Removal of large ovarian dermoid cysts causing torsion (twisting) can be done by laparotomy. The surgery may involve removal of the offending cyst or the ovary entirely if required. Sometimes one of the ovaries are left if the there is no malignancy or the cysts are not bilateral. However surgery often causes trauma and there can be other complications too. And of course, surgery cannot guarantee that the cyst will not reappear. There are other conventional treatments too, but they just treat the symptoms and not the root causes. Holistic remedies on the other hand treat the body as a whole to find out the root causes and eradicate them. And once these causes are gone, the cyst goes away, never to return again. 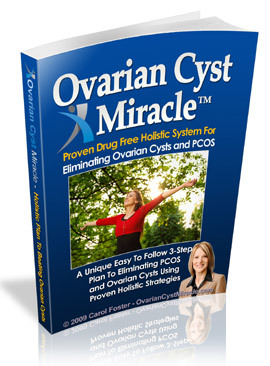 This approach is much better than just treating the symptoms and this is why holistic remedies have been so successful in the treatment of all kinds of ovarian cysts.